Chinese restaurants and takeaway outlets can be found in many Western towns and cities. In China, food is traditionally eaten with chopsticks, and according to Helpguide, adopting this habit when eating Chinese food can be healthier, because you will eat more slowly. Vegetables used in Chinese mixed vegetable dishes may include Chinese cabbage, pea pods, bamboo shoots and sliced mushrooms. A serving of steamed mixed vegetables is a low-calorie choice; many foods served in Chinese restaurants are high in fat, sodium and calories. A whole order of steamed mixed vegetables from a national restaurant chain contains around 200 calories. Stir-fried mixed vegetables are an item provided by many Chinese restaurants. One 8 oz. portion contains around 220 calories. Tofu and mixed vegetables is a Chinese meal that can be enjoyed by vegetarians, because while it provides protein, it does not contain animal products. An 8-ounce serving of tofu and mixed vegetables has approximately 200 calories. Portion size will vary depending on where you buy your food; and this will effect the total amount of calories consumed. 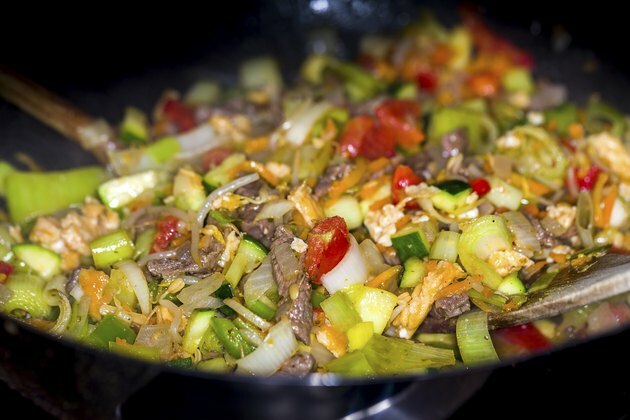 Other factors that will affect the calorie count of your Chinese meal are the exact ingredients and the quantity of oil used to cook the meal.